1741: born in Ôsaka. Son of the actor Arashi San'emon V, who gave him the name of Arashi Iwajirô I. 11th lunar month of 1752: Arashi Iwajirô I took the name of Arashi Hinasuke I and appeared on stage for the first time, as a wakaonnagata, performing with success in Namiki Shôzô I's drama "Nagoya Ori Hinatsuru no Nishiki" which was produced at the Kado no Shibai by the zamoto Mimasu Daigorô I. 11th lunar month of 1753: Hinasuke played at the Naka no Shibai the role of Okuma in the drama "Kashû Narihira Ishi". 1756: Hinasuke and his father settled in Kyôto. 1st lunar month of 1758: first Kabuki adaptation of the puppet theater drama "Gion Sairei Shinkôki", which was simultaneously produced at the Minamigawa no Shibai [casting] and the Kitagawa no Shibai [casting]; Hinasuke played in the former theater the role of Zesai's daughter Otsuyu. 12th lunar month of 1759: Hinasuke became zamoto and produced the drama "Bandai Fueki Hôrai Yakata". 2nd lunar month of 1760: Hinasuke produced the drama "Keisei Sajiki-ga-Dake", in which he played the role of the courtesan Kakehashi. His virtuosity at playing shamisen was appreciated by the connoisseurs. 11th lunar month of 1760: Hinasuke played at the Naka no Shibai the role of Miura's daughter Tamakoto in the kaomise drama "Miura no Ôsuke Toshitoku Môde", which was produced by Anegawa Shinshirô II; the role of Miura was played by Fujikawa Heikurô. 4th lunar month of 1762: first Kabuki adaptation of the 5-act puppet theater drama "Gosho Zakura Horikawa no Youchi", which was staged at the Naka no Shibai; Hinasuke played the role of Shinobu [casting]. 7th lunar month of 1763: Hinasuke played at the Kado no Shibai the role of Haru in the drama "Sugawara Denju Tenarai Kagami", which was produced by Nakayama Bunshichi I; his stage partners were Nakayama Bunshichi I (Matsuômaru, Terukuni), Nakayama Shinkurô I (Kakuju, Shihei), Bandô Toyosaburô I (Shiratayû), Anegawa Daikichi I (Tonami, Yae), Asao Tamejûrô I (Hyôei, Shundô Genba), Nakayama Raisuke I (Umeômaru), Fujikawa Hachizô I (Genzô, Sukune Tarô), Ichinokawa Hikoshirô II (Sakuramaru), Yoshizawa Sakinosuke II (Chiyo, Tatsuta) and Nakamura Kichiemon I (Kan Shôjô). 11th lunar month of 1763: the drama "Suma no Miyako Genpei Tsutsuji", which was originally written by Hasegawa Senshi and Matsuda Bunkôdô for the puppet theater in 1730, was adapted for Kabuki 33 years later by the playwright Namiki Eisuke I. It was entitled "Sakigake Genpei Tsutsuji" (the second drama of an unusual 3-part kaomise program) and staged at the Naka no Shibai, starring Nakamura Kichiemon I and Hinasuke in the roles of Kumagai Jirô Naozane and Taira no Atsumori. 9th lunar month of 1764: première in Ôsaka at the Naka no Shibai of "Hare Kosode Tsuzure no Nishiki", based on the puppet drama "Katakiuchi Tsuzure no Nishiki", which was produced by Mimasu Daigorô I. A similar play was staged one day before under a different title, "Oriawase Tsuzure no Nishiki", at the Kado no Shibai. The competition for the best performance and the best line-up was open between the 2 theaters. The performance at the Kado no Shibai was more successful than the one at the Naka no Shibai; Hinasuke played at the Naka no Shibai the role of Oroku [casting]. 5th lunar month of 1766: first Kabuki adaptation of the 5 acts puppet theater drama "Honchô Nijûshikô", in Ôsaka at the Naka no Shibai; Hinasuke played the role of Princess Yaegaki [casting]. 12th lunar month of 1766: Hinasuke produced at the Kado no Shibai the drama "Hirakana Seisuiki" in which he played the role of Umegae; his stage partners were Nakayama Shinkurô I (Gonshirô), Fujikawa Hachizô I (Matsuemon, Higuchi no Jirô Kanemitsu), Yoshizawa Ayame III (Oyoshi, Tomoe Gozen), Ichinokawa Hikoshirô II (Kajiwara Genta Kagesue), Nakayama Raisuke I (Shigetada), Arashi Koroku I (Enju) and Arashi Shichigorô II (Kajiwara Heiji Kagetaka). 7th lunar month of 1767: Hinasuke played in the same theater the role of Otatsu in the drama "Natsu Matsuri Naniwa Kagami", which was staged to commemorate the 6th anniversary (7th memorial service) of the passing away of Fujikawa Heikurô [casting]. Spring 1768: tour in Nagoya; Hinasuke played the roles of Tôyama and Matahei in Chikamatsu Monzaemon's drama "Keisei Hangonkô". 12th lunar month of 1768: Hinasuke played the roles of Nuregami Chôgorô and Oteru in the drama "Futatsu Chôchô Kuruwa Nikki", which was produced by Yamashita Yaozô I in Ôsaka. The performance was extremely successful and extended to please Hinasuke's fans. Summer 1769: Hinasuke and the playwright Namiki Shôzô I went on tour together in the Awa province on Shikoku island. 11th lunar month of 1769: Hinasuke was back to Kyôto. He played the role of the courtesan Naniwazu in the kaomise drama "Asahimaru Genji Kagami", which was produced by Onoe Kumesuke, welcomed in the Imperial City the actor Sawamura Sôjûrô II and his son Sawamura Tanosuke I and celebrated the shûmei of Nakamura Shingorô II. Hinasuke successfully ended the performance with an amazing lion dance ("Shakkyô"). 1770: tour on Miyajima Island in the company of Arashi Sangorô II. 11th lunar month of 1770: Hinasuke was back to Kyôto. He played at the Kitagawa no Shibai the role of the courtesan Shizuhara in the kaomise drama "Sakae Genji Gojin no Kachidoki", which was produced by Mimasu Tokujirô I. 3rd ~ 5th lunar months of 1771: first Kabuki adaptation of the puppet theater drama "Imoseyama Onna Teikin", produced by Mimasu Tokujirô I at the Kitagawa no Shibai; Hinasuke played the roles of Sadaka and Omiwa [casting]. 4th lunar month of 1771: Hinasuke played in the same theater the role of Kan Shôjô in the classic "Sugawara Denju Tenarai Kagami". 11th lunar month of 1771: Hinasuke played at the Minamigawa no Shibai the role of the dancer Okumi in the kaomise drama "Bandai Isaoshi Genji", which was produced by Arashi Sanjûrô II. 1st lunar month of 1772: Hinasuke played in the same theater the roles of the keisei Sakurado and Shôsuke's sister Osuga in the ni-no-kawari "Keisei Sakura Goten". Fall 1772: Hinasuke played in Kyôto the role of Sadaka in the drama "Imoseyama Onna Teikin", which was produced by Arashi Sanjûrô II. 9th lunar month of 1773: Hinasuke played at the Kado no Shibai the role of Otoku in the drama "Keisei Hangonkô", which was produced by the zamoto Ogawa Kichitarô I for the nadai Ôsaka Tazaemon; his stage partners were Nakayama Raisuke I (Shôgen) and Mimasu Daigorô I (Matahei). 12th lunar month of 1773: Hinasuke played at the Naka no Shibai the roles of Kanpei and Osono in the classic "Kanadehon Chûshingura", which was produced in Ôsaka by the zamoto Arashi Matsujirô I. Fall 1774: Hinasuke moved to Kyôto. 11th lunar month of 1774: Hinasuke took part in the kaomise program "Akanesasu Kogane no Maruyama", which was produced by Fujikawa Sango; his stage partners were Onoe Kikugorô I, Onoe Matsusuke I and Sawamura Sôjûrô III. 3rd lunar month of 1775: Hinasuke played in the same theater the role of the sumô wrestler Nuregami Chôgorô in the play "Futatsu Chôchô Kuruwa Nikki"; his stage partner in the role of the rival sumô wrestler Hanaregoma Chôkichi was Onoe Matsusuke I. 9th lunar month of 1775: Hinasuke played in the same theater the role of the warrior Kumagai Jirô Naozane in the drama "Ichi-no-Tani Futaba Gunki". Fall 1775: Hinasuke moved to Ôsaka. 11th lunar month of 1775: Hinasuke performed at the Naka no Shibai in the kaomise drama "Gohiiki Tenmokuzan", which was produced by Mimasu Matsunojô. 12th lunar month of 1775: Hinasuke played in the same theater the roles of Yuranosuke and Oshun in the classic "Kanadehon Chûshingura". 1st lunar month of 1776: his rank in Ôsaka hyôbanki, tachiyaku section, was jô-jô-kichi (superior - superior - excellent). 5th lunar month of 1776: his father Arashi Koshichi I appeared on stage for the last time, in Ôsaka at the Naka no Shibai. The 2 actors performed together in the drama "Komochi Yamanba Iohata Nishiki", which was produced by Mimasu Matsunojô. Hinasuke also played the great role of Danshichi Kurobê in the drama "Natsu Matsuri Naniwa Kagami"; his stage partners were Arashi Kichisaburô I (Tokubê) and Mimasu Daigorô I (Sabu). 7th lunar month of 1776: Hinasuke played in the same theater the role of the warrior Kumagai Jirô Naozane in the drama "Ichi-no-Tani Futaba Gunki". 11th lunar month of 1776: Hinasuke played at the Kado no Shibai 2 roles in the kaomise drama "Ehôgura Sankai Meisho", which was produced by Ogawa Kichitarô I. 4th lunar month of 1777: premiere of Namiki Gohachi's drama "Tenmangû Natane no Gokû", co-written with Nakamura Akei and Tatsuoka Mansaku, which was staged at the Kado no Shibai; Hinasuke played the roles of Fujiwara no Shihei and Kakuju [casting]. 9th lunar month of 1777: Hinasuke played in the same theater the roles of Yazaemon, Ginpei, Tomomori, Tadanobu and the fox Genkurô in the drama "Yoshitsune Senbon Zakura". 11th lunar month of 1777: Hinasuke played at the Kado no Shibai the roles of Shôki (in reality Shinozuka Iga-no-Kami) and Inukai Rokurobê in the kaomise drama "Ôiri Kabuki no Tsuitachi", which was produced by Ogawa Kichitarô I and celebrated the shûmei of Shibazaki Rinzaemon II. 4th lunar month of 1778: premiere in Ôsaka at the Kado no Shibai of Namiki Gohê's drama "Kinmon Gosan no Kiri"; Hinasuke played the roles of Ishikawa Goemon and Akechi Samagorô [casting]. 9th lunar month of 1778: Hinasuke played in the same theater the role of Hangaku in the drama "Wada Gassen Onna Maizuru". 7th lunar month of 1779: Hinasuke played in the same theater the roles of Ishikawa Akuemon and Ashiya Shôgen in the drama "Ashiya Dôman Ôuchi Kagami". 9th lunar month of 1779: Hinasuke played in the same theater the role of Asaina in the drama "Azuma Kagami Mikari no Maki". Fall 1779: Hinasuke moved to Kyôto. 11th lunar month of 1779: Hinasuke performed in the drama "Kaikei Kikkegawara", which was produced by Somematsu Shichisaburô II. 1st lunar month of 1780: Hinasuke's rank in the Kyôto hyôbanki, tachiyaku section, was dai-jô-jô-kichi (grand - superior - superior - excellent). Namiki Gohê's drama "Kinmon Gosan no Kiri" was produced for the first time in Kyôto; Hinasuke played the role of Ishikawa Goemon [casting]. 9th lunar month of 1780: Hinasuke played in the same theater the roles of Tokiyo, Kakuju and Matsuômaru in the classic "Sugawara Denju Tenarai Kagami". Fall 1780: first and last stay in Edo for Hinasuke. 11th lunar month of 1780: Hinasuke performed at the Moritaza in the kaomise drama "Tokimekiya Oedo no Hatsuyuki" but his performance was not well received by the critics and the audience. He was humiliated and decided to go back to Kamigata instead of losing his time and pride in this city. 1st lunar month of 1781: Hinasuke was back in Kyôto, triumphing in the drama "Miyako no Hamaogi", which was produced by Yamashita Yaozô I. 6th lunar month of 1781: tour in the Kishû province. 9th lunar month of 1781: Hinasuke played at the Kitagawa no Shibai the roles of Kajiwara Heiji Kagetaka, Matsuemon and Higuchi no Jirô Kanemitsu in the drama "Hirakana Seisuiki", which was produced par Yamashita Yaozô I; his stage partners were Onoe Kikugorô I (Enju, Shigetada), Arashi Sangorô II (Kajiwara Genta Kagesue), Sawamura Kunitarô I (Chidori), Shibazaki Rinzaemon II (Takatsuna, Gonshirô), Arashi San'emon VI (Ofude) and Anegawa Minato II (Oyoshi). Hinasuke suddenly fell ill and had to be replaced by Nakamura Tôzô I. 1st lunar month of 1782: his rank in the Kyôto hyôbanki, tachiyaku section, was goku-dai-jô-jô-kichi (extreme - grand - superior - superior - excellent). 3rd lunar month of 1782: Hinasuke played the roles of Yuranosuke, Tonase, Moronô and Sadakurô in the classic "Kanadehon Chûshingura", which was produced in Kyôto at the Higashigawa no Shibai by the zamoto Yamashita Yaozô I.
sumô wrestler Nuregami Chôgorô was Yamashita Yaozô I. Summer 1782: Hinasuke played in the same theater the role of Fukashichi in the drama "Imoseyama Onna Teikin". 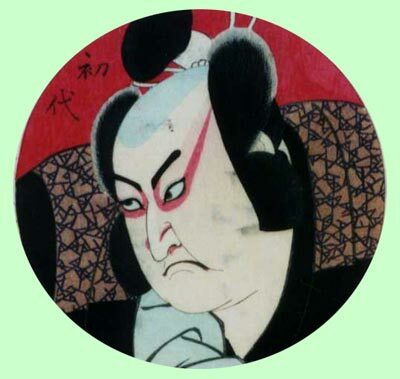 1st lunar month of 1783: Hinasuke played the role of the fox Tadanobu in the drama "Yoshitsune Senbon Zakura", which was produced in Kyôto at the Shijô Nishi no Shibai; his stage partner in the role of Shizuka Gozen was Nakamura Tomijûrô I. 3rd lunar month of 1783: tour in Nagoya; Hinasuke performed at the Ôsu no Shibai. 7th lunar month of 1783: the play "Kagamiyama Kokyô no Nishikie" was performed for the first time in Ôsaka, at the Kado no Shibai. Hinasuke played the role of the vile court lady Iwafuji; his stage partners were Sawamura Kunitarô I (Onoe) and Yamashita Kinsaku II (Ohatsu). 1st lunar month of 1785: Hinasuke played the roles of Sagisaka Sanai, Shigenoi and Takemura Sadanoshin in the drama "Koi Nyôbô Somewake Tazuna", which was performed in Ôsaka at the Kita-Shinchi no Shibai. 26th day of the 8th lunar month of 1785 : his disciple Arashi San'emon VI died in Ôsaka. 9th lunar month of 1785: Hinasuke played in Kyôto at the Kitagawa no Shibai the roles of Ishidô Umanojô, Teraoka Heiemon, Amakawaya Gihei and Kakokawa Honzô in the classic "Kanadehon Chûshingura", which was staged to commemorate the 2nd anniversary (3rd memorial service) of the passing away of the star Onoe Kikugorô I. Fall 1785: tour in Ise, Kuwana and Misaki with Shibazaki Rinzaemon II; Hinasuke played the roles of Tadanobu, Igami no Gonta and the fox Genkurô in the classic "Yoshitsune Senbon Zakura". 11th lunar month of 1785: Hinasuke played in Kyôto the roles of Matsuômaru and Kakuju in the drama "Sugawara Denju Tenarai Kagami", which was produced by his son Arashi Hidenosuke I. 1st lunar month of 1786: Hinasuke was back in Ôsaka and performed in the drama "Ôtô-no-Miya Asahi no Yoroi", which was produced by Arashi Umanosuke at the Kita-Horie Ichi-no-Gawa Shibai. 2nd lunar month of 1786: Hinasuke played in the same theater the role of the legendary thief Nippon Daemon in the drama "Akiba Gongen Kaisen Banashi". 3rd lunar month of 1786: Hinasuke moved to the Naka no Shibai and played the role of Hangaku in the drama "Wada Gassen Onna Maizuru", which was produced by Nakamura Noshio II. He also played the roles of Ishikawa Goemon and Watônai in the plays "Kama-ga-Fuchi Futatsu Domoe" and "Kokusen'ya Gassen". 5th lunar month of 1786: Arashi Hinasuke I took the name of Kanô Hinasuke I. 26th day of the 7th lunar month of 1786 : his father Arashi Koroku I died. 3rd lunar month of 1787: premiere at the Naka no Shibai of Namiki Gohê's drama "Taikô Shinkenki", a play similar to "Hikosan Gongen Chikai no Sukedachi"; Hinasuke played the roles of Rokusuke, Okô and Mashiba Hisayoshi [casting]. 8th lunar month of 1787: Namiki Gohê's drama "Taikô Shinkenki", which was premiered in the 3rd lunar month at the Naka no Shibai, was staged for the first time in Kyôto; Hinasuke played the roles of Rokusuke, Okô, Mashiba Hisayoshi and Yoshioka Ichimisai [casting]. 1790: Hinasuke published "Minshisen", a book of commentaries he wrote on the greatest roles of his career. 12th lunar month of 1790: Hinasuke played for the last time the role of Ishikawa Goemon in the drama "Kinmon Gosan no Kiri", in Ôsaka at the Naka no Shibai; the role of Mashiba Hisayoshi was played by Arashi Sangorô II. 7th lunar month of 1791: Hinasuke played for the last time the role of Danshichi Kurobê in the drama "Natsu Matsu Naniwa Kagami", in Ôsaka at the Kita-Shinchi no Shibai. 7th lunar month of 1792: Hinasuke played at the Kitagawa no Shibai the role of Gotobê in the play "Yoshitsune Koshigoejô". 3rd lunar month of 1793: Hinasuke played the roles of Mizuo Jûzaemon and Tôken Jûbê in the drama "Hirai Gonpachi Yoshiwara Gayoi", which was produced in Ôsaka by the zamoto Asao Okujirô I. 5th lunar month of 1793: Hinasuke played in the same theater the role of the warrior Kumagai Jirô Naozane in the drama "Ichi-no-Tani Futaba Gunki". 11th lunar month of 1793: Kanô Hinasuke I took the name of Arashi Koroku III in Ôsaka at the Horie Shinshibai, performing in the drama "Chûshin Kôshaku". 1st lunar month ~ 3rd lunar month of 1794: premiere of Tatsuoka Mansaku's drama "Keisei Haru no Tori", which was famous for its "Umagiri" scene and was produced by the zamoto Asao Okujirô I in Ôsaka at the Kado no Shibai; Koroku played the roles of Shibata Shurinosuke Katsushige, Kawata Kachizaemon, Iruma Yosodayû, Teruha and Oda Sanshichirô Nobutaka (when he replaces Ichikawa Danzô IV in this role) [more details]. 5th lunar month of 1794: Arashi Koroku III celebrated his shûmei in Kyôto, at the Shijô Nishi no Shibai, playing the prestigious role of the warrior Kumagai Jirô Naozane in the jidaimono "Ichi-no-Tani Futaba Gunki". 5th lunar month of 1794: premiere at the Nishi no Shibai (Kyôto) of Namiki Gohei I's drama "Godairiki Koi no Fûjime"; Koroku played the role of Sasano Sangobê [casting]. 3rd lunar month of 1795: Chikamatsu Monzaemon's drama "Komochi Yamanba", which was originally written for the puppet theater, was adapted for Kabuki for the first time, in Ôsaka at the Kado no Shibai; Koroku played the role of Oginoya Yaegiri [casting]. 11th lunar month of 1795: Koroku played in Chikamatsu Tokuzô's kaomise drama "Ichiban Yari Tôkai Suzuri", which was produced by Fujikawa Hachizô III in Ôsaka at the Kado no Shibai. 1st lunar month of 1796: Koroku played in the same theater 5 roles in the new year drama "Keisei Hana no Ôminato", commonly called "Tôjin Goroshi". 3rd lunar month of 1796: Koroku was about to perform in "Hade Kurabe Ishikawazome" but he seriously fell ill.
29th day of the 3rd lunar month of 1796 : Koroku died in Ôsaka . Arashi Koroku III was one of the finest and greatest Kamigata actors who achieved an amazing success during the second half of the eighteenth century. He was also the first actor to play the role of Ishikawa Goemon in "Gosan no Kiri". He was outstanding in katakiyaku roles and in hengemono. His tombstone was located in the precinct of Hômyôji Temple in Ôsaka.